Gorgeous deep crimson red blooms. My plant is now 3 years old, and this summer it really came into it’s own. I nice compact plant, with scores of blooms that just kept coming. 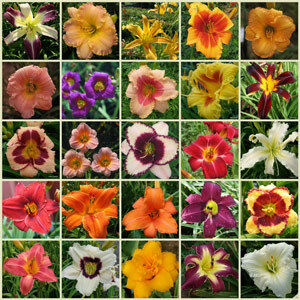 One of the longest blooming daylilies in my collection, and I am nearing hoarder status at this point. 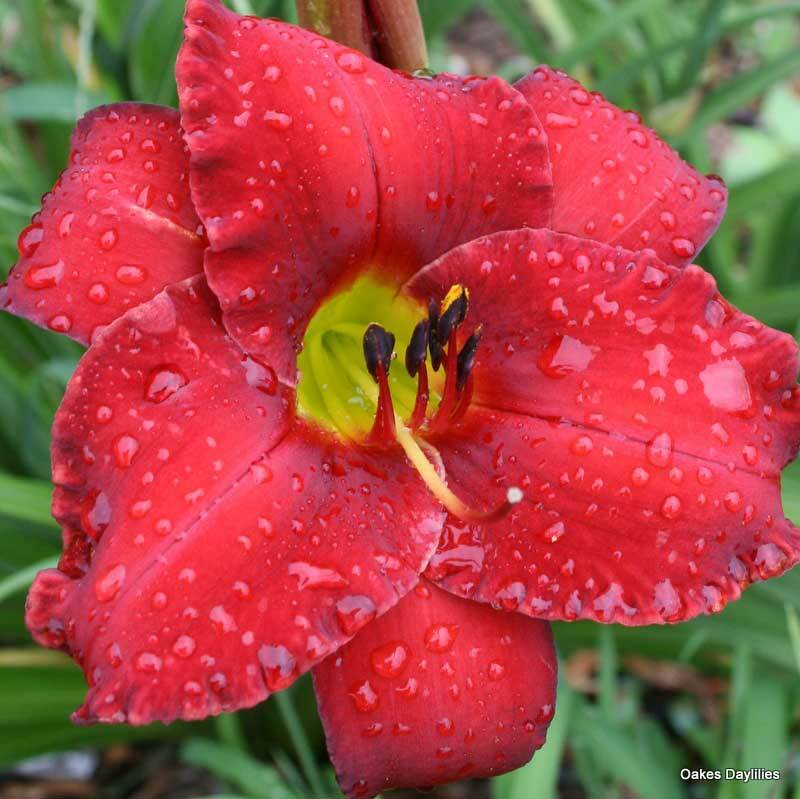 I would rank it with ‘Red Volunteer’ as one of the showiest daylilies you can plant. A beautiful shade of red! Bloomed late June in AL and is still going… Nice size to put in front of my yellow Siloam Space Age. Great contrast; shows up much better with yellows. I sent photos of this crimson beauty to UA fans I know…Roll Tide! DRY WKS. A BEAUTIFUL LILY. THANKS OAKES!!!!!!!!!!!!! I have had Crimson Rose for 3 or 4 yrs now. I love this it has a Royal look to it. must be the shade of red with the highlights. It always looks so stunning. 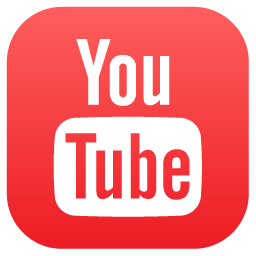 MUST have – it’s such a strong performer at the end of the season. Lots and lots of beautiful flowers! I have mine shaded and it still blooms like crazy. Beautiful deep dark-red in part shade location. My plant is one year old and the blooms are held on short stems and does not rise above foliage. 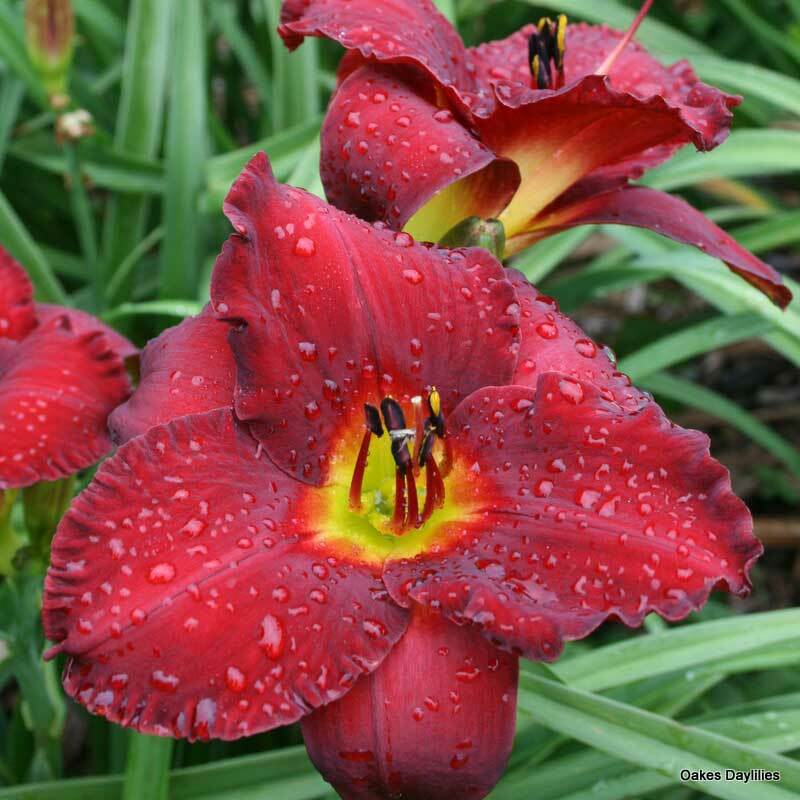 Nice daylily. 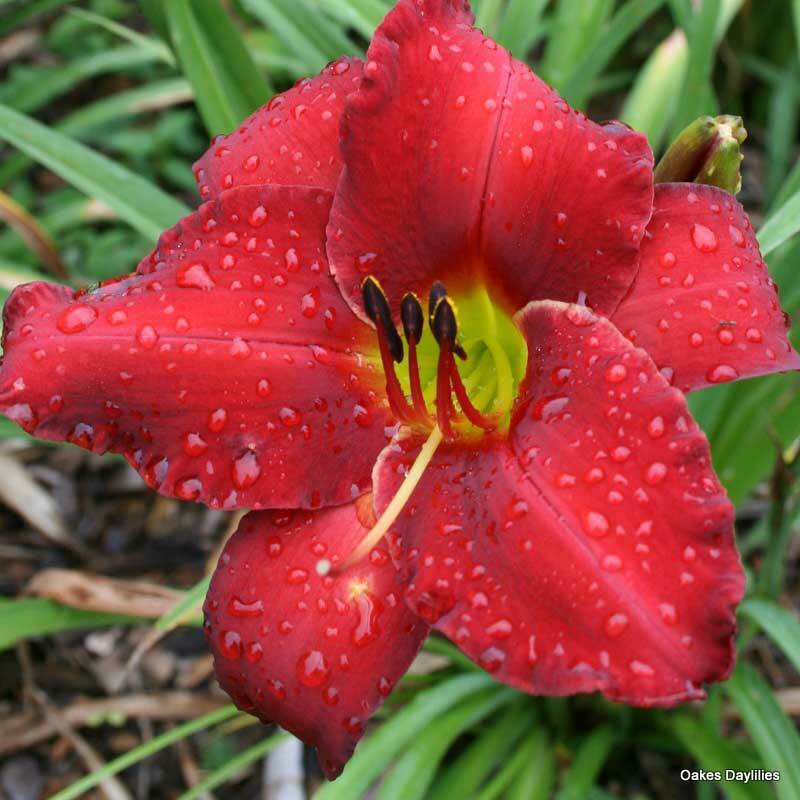 What a show-topper, just when you’er getting used to seeing daylilies blooming everywhere! I can’t stop taking pictures of mine! The catalog doesn’t do it full justice – it is so much richer in color plus soft and velvety to the touch. Only one word of advice – grab your camera and run out to it if you hear thunder! This flower hates rain and bleaches out when it gets wet. 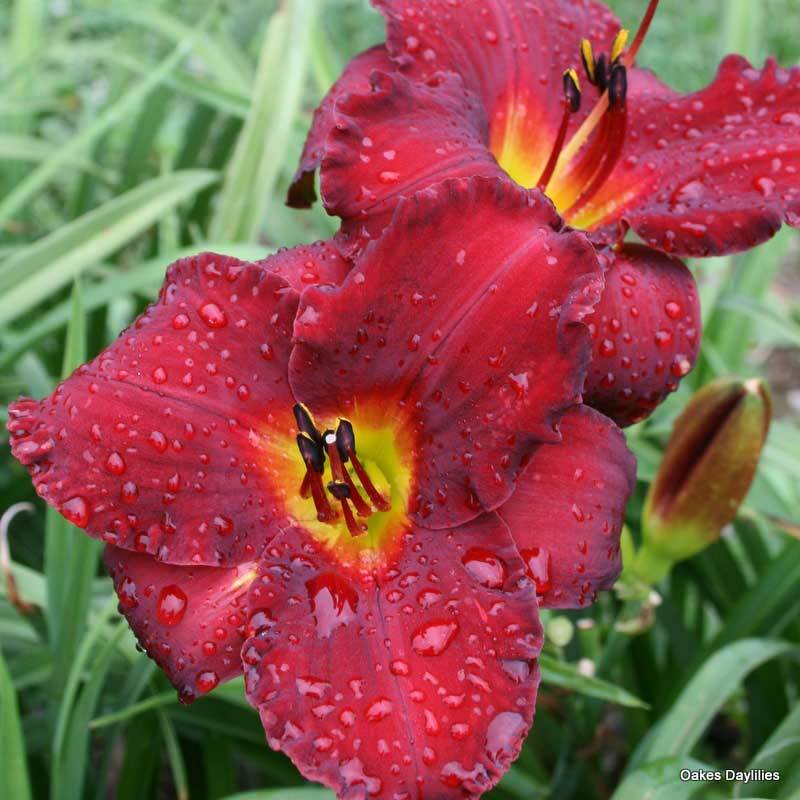 It is now the middle of July in our zone 6.5 garden and, while most of our daylilies have already had their time in the spotlight, Crimson Shadows is now in full, glorious bloom, putting on a most welcome show. Our Crimson Shadows has a rich, deep, velvety color that is darker than the picture, and more beautiful. I find myself exclaiming ‘Wow!’ each time I look over at it. 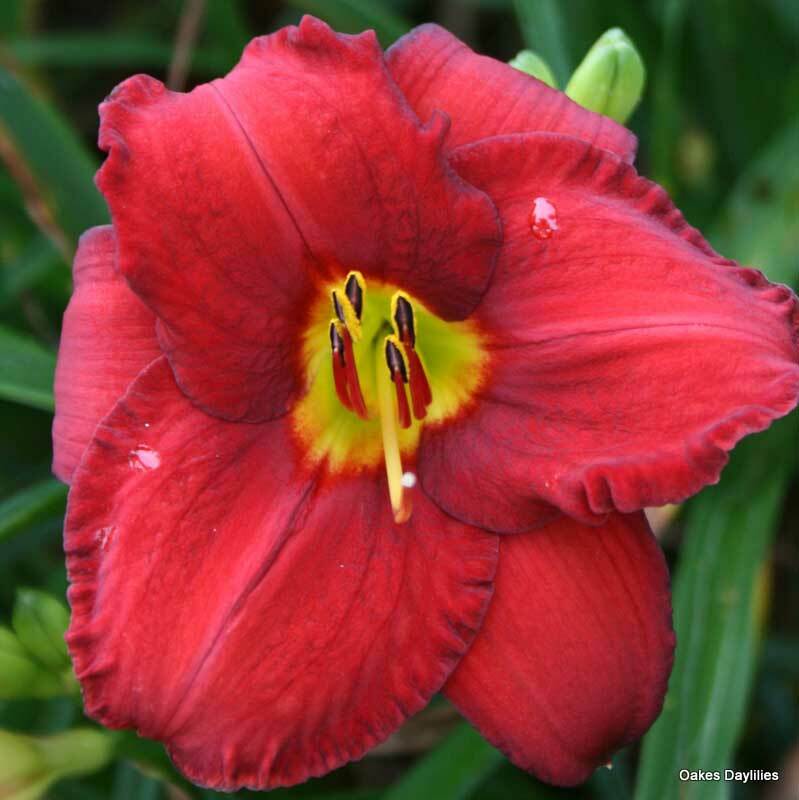 Thanks, Oakes, for such a special daylily. A beautiful shade of red. Lots of large flowers. The plant makes nice clumps. My only complaint is that it does not re-bloom. But overall, a terrific daylily. 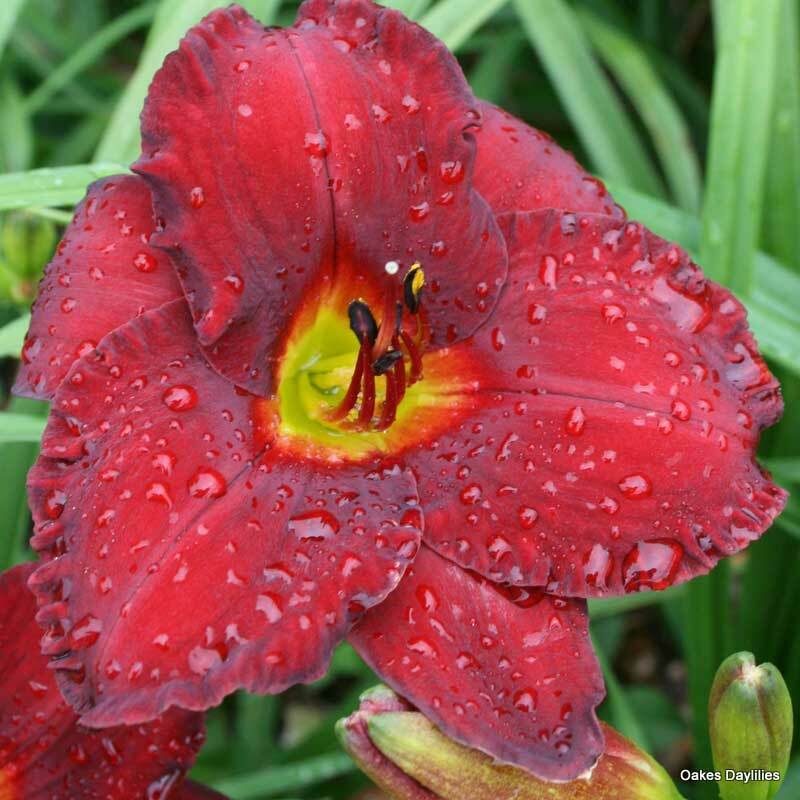 The velvet on this lily makes you stop to touch each time, like passing a beautiful pet. Mine is also darker and shimmers, almost a Victorian red. Looks especially good with whites or yellows because it is short and dark, it needs the contrast to showcase. Darker in my garden – a true crimson – not at all rosy as in the picture. First bloom in year 3 – had a bad compost year followed by a “cat invasion” two winters ago. Its really lovely, but I need to move it away from the lavendars and pinks. I’ll be ordering more. 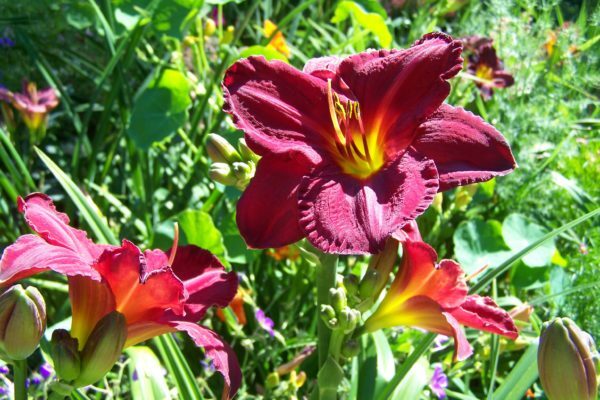 I received this daylily as a gift for attending the Daylily Festival last year (2006). What a pleasant surprise! I plan on buying more of these beauties this fall. Beautiful color and a nice long bloom period. Bloomed well this summer despite drought conditions for most of the year. Went out this morning (been eagerly anticipating). WOW!!! Deep, dark red. Amazing! Beautiful!